Ever wondered how to fund a postdoc, a research stay or a sabbatical in Europe? How to invite a European researcher to your lab? the MSCA-IF grants are for you! Ever wanted to create your own research team in Europe,receive millions of Euro in research funding and being able to administrate it yourself? The ERC grants are for you! Yes, but… How do I apply? Is my research project appealing enough? What about the success rate? How to write a grant application? 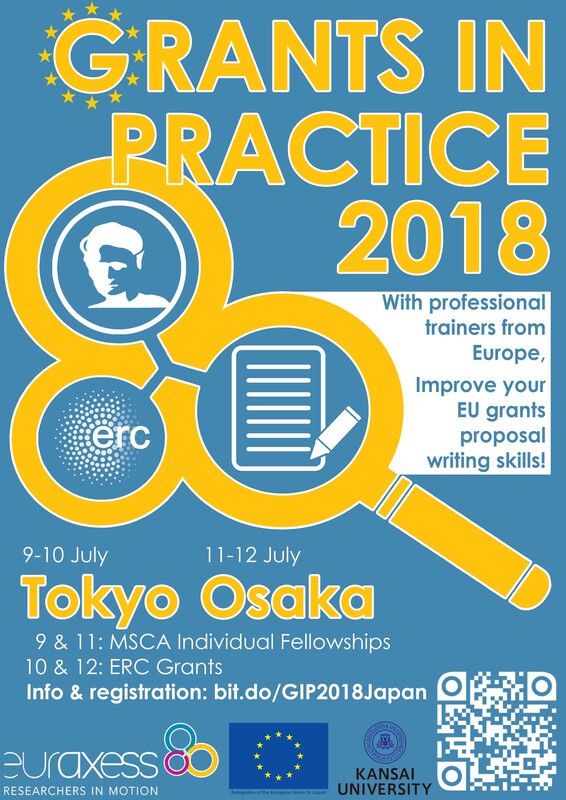 EURAXESS Japan organises a multi-day event, bringing especially to Japan for the occasion two professional trainers in grant writing from Europe and dedicating, once in Tokyo, once in Osaka, one full day to train local researchers on each grant scheme. PhD students, postdocs and researchers, professors (no age limit! ), research administrators and managers most welcome! All disciplines including humanities and social sciences! Copyright 2019 © EU-Japan Centre for Industrial Cooperation All Rights Reserved.